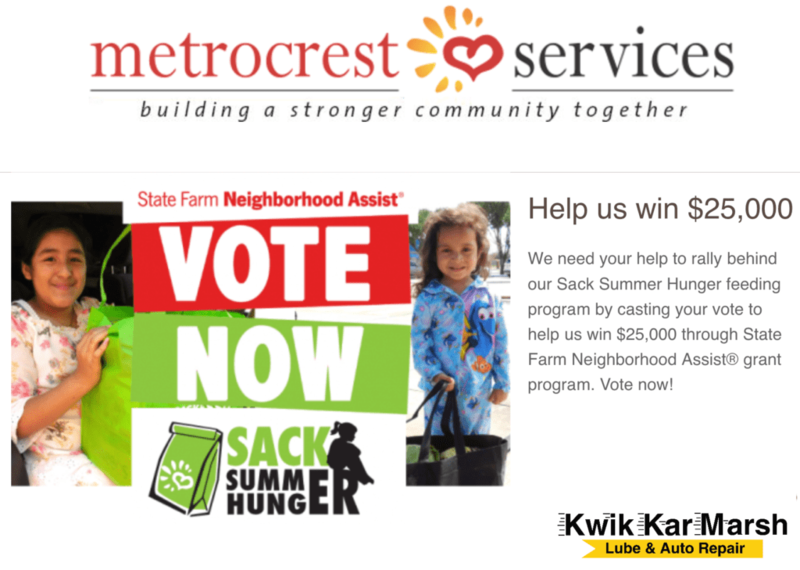 Help our friends at Metrocrest Services win a $25,000 grant from State Farm. Metrocrest Services is one of 200 non-profits selected by State Farm to win a $25,000 grant for our 2019 Sack Summer Hunger program which serves over 1,500 kids in Carrollton, Farmers Branch, Addison and Coppell. It is a voting contest. The top 40 vote-getters each win a $25,000 grant. You can vote 10 times a day from each of your email addresses. Corrine and I went online to place our votes this evening. It is really simple. In fact it will allow you to place all 10 votes at once. Please consider voting today and each day through August 24, 2018. HERE IS THE LINK TO VOTE FOR METROCREST SERVICES – ONE OF THE BEST NON-PROFITS HELPING OUR COMMUNITY.